“I don't like spinach, and I'm glad I don't, because if I liked it I'd eat it, and I just hate it.” Clarence Darrow said this (In response to what- I’m unsure of), but a large majority of the food connoisseurs of the world would agree in unison with Clarence- probably with emphatic head nodding and nose wrinkling too. I don’t think I’d blame them. Spinach is not exactly meant to be a gastronomic delight- but if one was to weigh its virtues against its effect on the taste buds- then I must admit, the pros far outweigh the cons. It is one hell of a great input for the body’s overall well being and its goodness reinforces the validity of the reasons for Popeye’s immense success as the muscle popping cartoon action figure that he continues to be even today! The large triangular (or oval shaped) leaves of the plant, a Chenopoid species of the Amaranthaceae family, is classified into three basic types aka Savoy-with the dark green and crinkly leaves, the Flat leaf spinach and the hybrid Semi Savoy variety with slightly crinkly leaves. Spinach is well stocked up on the much coveted Vitamin A- an essential nutrient most well known as the driving force behind strong eyesight. The Recommended Daily Intake (RDI) of Vitamin A for a healthy female aged 19-70 years of age ranges between 770-3,000 mg, while the RDI for men in the same age group is 700-3,000mg.According to Nutrition Data, 1 cup of raw spinach, equivalent to 30g of the leaves in weight, accounts for a whopping 56% of Vitamin A, followed by 14% Vitamin C, while it boasts an absolute absence of trans fat, saturated fat and cholesterol. Weight loss aficionados-there’s a cue good enough for you to start stocking up on the not so savoury, but highly nutritious leafy vegetable. Apart from the Vitamins, the same serving of raw spinach would contain around 5% iron- a very rich source of the mineral like most other leafy vegetables and extremely useful for non-vegetarians who do not have access to Iron in the traditional meats and minces. In fact according to the US agriculture department, a 180g serving of boiled spinach contains nearly 6.5 mg Iron, while a 170g ground hamburger patty would contain only 4.5mg- a mere trifle. This does definitely promote vegetarianism to an extent if one thinks about it carefully. 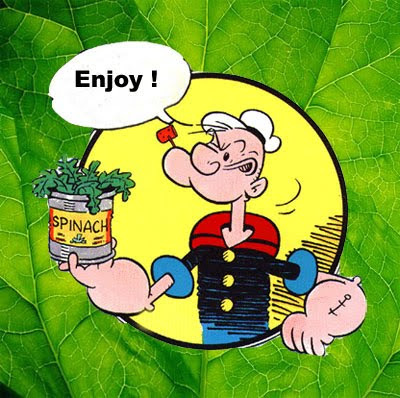 Popeye owes his famous muscles and strong public persona to the iron content in the humble tins of spinach that seem to magically appear out of nowhere wherever he goes. Although it is a relatively little known fact that the corncob smoking, pipe-tooting sailor with the anchor tattoos and characteristic receding hairline, exists because of a sheer miscalculation. In 1870, Dr E Von Wolf published a study which claimed (mistakenly I presume), that spinach contained 10 times the iron content when compared to other leafy veggies. Next on the time line, the spinach toting baggily appareled sea farer appeared in the first daily comic strip Thimble Theatre, after which he gained his own little strip in 1937. It was not until 1939, that some German scientists conducted further study on the apparent “wonder plant” and came to the conclusion that it contains only 1/10th the amount of iron that Wolfe claimed earlier. After that, such wide publication and circulation of Popeye strips came to a crashing halt. However, despite the nutritional discrepancy, Popeye continues to be one of the world’s most favorite animated sailors and he continues to regale his fans with his funny-muscle antics and fresh methods of saving his eternally distressed damsel-his “Goyle”. Although the cartoon character’s loyal fan following did have a role to play in the strips unusual timelessness, the readers’ acknowledgement of the foodstuff which was the only tangible “reality” in Popeye’s world and the subconscious knowledge of the wholesome goodness of the unsavory vegetable, definitely had an impact on the general psyche, adding to the cartoon’s popularity. Also, according to some other sources, the initial analysis by Wolf, was done on 1 kg powdered spinach, but spinach being 90% water (yeah! There’s something you didn’t know!) which portrayed spinach as having an iron content of around 3.5mg/ 100g- 10 times lesser (as proven by the German scientists) than Wolf’s figure. However, even 3.5mg Fe/100 g of spinach is a big quantity, but this quantity alone does not make spinach as pronounced a power food as it is, since all the oxalic acid it contains, interferes with Iron uptake. It is the other minerals like Vitamins B1, 2, 6, E and K and other components such as Calcium, Biotin and Niacin apart from the above-mentioned constituents, which make spinach the proudly nutritious vegetable that it is accepted as today. Spinach has been the cause of some misadventures such as the 2006 E.coli outbreak in the USA due to infected spinach packets in grocery stores (caused 5 deaths) and the 2007 USA Salmonella outbreak also attributed to around 8,000 affected cartons of spinach. However, on the whole, it has been a fairly benevolent and largely nutritious vegetable, which is highly recommended as a part of the daily diet. Going over the value of the nutrients available in spinach, Vitamin A, which is also found in cantaloupe melons, kale, and papaya, is important for the maintenance of good vision as well as in other relatively external physical attributes such as skin health, bone metabolism and in anti-oxidant activity. Other than that, it also plays a part on the molecular and cellular level, in gene transcription, immune function, Haematopoiesis and embryonic development. Vitamin C also acts as a strong antioxidant, lessens oxidative stress, and on the molecular level acts as as substrate for an enzyme called Ascorbate Peroxidase. It also acts as an enzyme cofactor- essential for important for essential biochemical reactions and the synthesis of collagen which suffers during a Vitamin C deficiency, causes the much hyped deficiency disease called Scurvy. Vitamins of the B Group, are responsible for the smooth functioning of metabolic activitites, healthy skin and muscle tone, enhancement of the immune and nervous system as well as promotion of cell growth and functioning. All B Vitamins have been known to reduce the chances of being diagnosed with pancreatic cancer- but only when ingested in the RAW form and not as a tablet. The main purpose of Vitamin K in human nutrition is its role in blood coagulation via Prothrombin. K has also been lauded for its potential role in bone health and has been studied in relation to treating Alzheimer’s disease and cancer. Nutritional calcium is a critical element for many bodily functions, such as bone growth and maintenance, muscle and nerve control, blood clotting, and blood pressure regulation. Meanwhile, α-Tocopherol present in Vitamin E, helps protect cell membranes from rapid oxidation processes. So all in all, it is pretty evident that spinach is one of the POWERFOODS that play a quintessential role in good health. It also goes to show that Popeye was no mean sailor with a taste for random greens, but he KNEW about the overall nutritional boost available in a neat little tin of spinach. So if you’ve outgrown Popeye comics, then just be mature about it and incorporate spinach into your regular diet. And if you’re a child (in years or at heart) and enjoy reading of Popeye’s various exploits, go a step further and listen to what your mum always has to say – Eat your Spinach! I eat spinach regularly as we get it so fresh in farmers market ... all I do is cut it up , sautee with garlic n dried red chillis n then add dal to it ..... palak dal simple n yummy ! another interesting way to eat it is steam it n add with melted cheese , salt n pepper in a sandwich / sub ..... some more yummy recipies r palak paneer , palak paratha n palak pakoda ... but not as healthy as dal or soup ! ! enjoy !